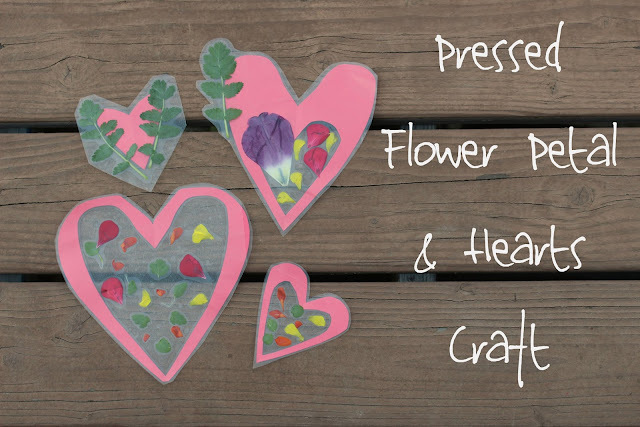 If you are looking for a simple and fun nature inspired Valentine's Day craft for kids, then you will love these pressed flower petal hearts. Crafting with flower petals was a fun experience for us. Even with the limited flower selection in our yard, we (my daughter and I) were able to create a few petal filled Valentine's Day hearts. This is a cute and fun kids Valentine's Day craft that is great for all ages and easily adaptable for younger kids. Sometimes I get an idea for a craft and we just go with it and see if it works out. Such was the case with our pressed flower petal hearts. 1. Cut a large piece of Contact paper and lay it sticky side facing up. I taped ours to a large piece of foam core so I could take it outside. 2. Cut out paper heart with scissors or use pre-cut ones from the craft store. 3. Lay the paper hearts on the craft paper. (You can alternatively do this step last before you add more Contact paper). Lay flower petals and leaves inside, on top of, or outside the hearts. Cover your hearts with a second layer of Contact paper. (working from the outside in). Cut out your flower petal hearts, give to a friend or hang in a window!! And there you have it! Alternatively, you can have younger kiddos lay flower petals and leaves on open-faced Contact paper and then add hearts and cover with contact paper after.